Yesterday, I had the pleasure of watching the game between champions Asante Kotoko FC and struggling Bechem United FC. It was actually one of the best games I have ever seen from the GLO Premier League. Surprisingly, Bechem United FC took the lead through a wonderful shot from Reginald Asante after poor defending by the Kotoko-defenders. Kotoko reduced the score when Augustine Okrah crossed from the left and found Ahmed Touré in front of goal. The Ivorian striker scored an easy tap-in goal. A few minutes later, the enterprising Augustine Okrah scored one of the best goals I have seen all season. Okrah won the ball about 30 meters from the goal and scored through a thunderbolt shot that went straight into the net, hitting the cross-bar first. Quite possibly the goal of the season. In the second half, Ahmed Touré scored his second of the evening when he followed a long goal kick from goalkeeper Isaac Amoako and lobbed over the out-rushing goalkeeper Maxwell Fiifi Eshun. A wonderful finish from Touré. Bechem United FC fought their way into the match, first through a strong header from Reginald Asante after a clinical cross from the impressive left-back Rashid Abdul. Asante became a hat-trick hero when he scored 3-3 through a penalty goal. Daniel Nii Adjei showed yet again what an important player he is, scoring the matchwinning goal about 15 minutes from full time. Asante Kotoko FC played with their backup goalkeeper Isaac Amoako (born 20.08.1983). Amoako conceded three goals but should not be blamed for any of them. Amoako seemed confident and made a few great saves, showing that it is way too early to write him off. I find it rather obvious that Amoako would be first choice goalkeeper at most top level teams in Ghana. The impressive Yaw Frimpong (born 04.12.1986) played at right-back while Gideon Baah (born 01.10.1991) played at left-back. Both players are modern-style full-backs with attacking qualities and an impressive work rate. Baah has made an impressive return to the first team after struggling with injury for about a year. The central defensive pair of Mohammed Awal (born 01.05.1988) and captain Henry Ohene Brenya (born 04.05.1985) is widely considered as the best in the league, but I was not too impressed this afternoon. Both players looked somewhat shaky and were not up to their regular standards. Okrah was replaced with David Ofei (born 07.06.1989) during the second half. Ofei fought hard on the left-wing. Richard Yeboah had a rather quiet game at the right-wing, struggling with Rashid Abdul at the left-back of Bechem United FC. Yeboah, usually a pacy, hard-working winger, was replaced with Frank Boateng (born 17.08.1984). Boateng, the experienced central midfielder, was able to take control over the midfield with his strong passing and great overview. I am pretty sure that Afranie Yeboah is the kind of player that would do very well in my local league, the Norwegian. Yeboah is disciplined, works hard, defends well and always seems to choose security over entertainment. Yeboah is the kind of player every team needs, although he rarely catches any headlines. Daniel Nii Adjei is a brilliant midfielder who controls the ball like few other players in Ghana. Adjei sometimes reminds me of Frank Lampard of Chelsea FC. Both players also share the ability to be at the right place at the right time, scoring a considerable amount of goals. Adjei scored his fifth league goal of the season. Michael Anaba should be thrilled after a wonderful first season at Kotoko. I have seen Anaba better, but he is a very skillful and intelligent player. Ahmed Touré (born 17.07.1987), the Ivorian star player, played as a lone strike and scored his seventh and eighth goal of the season. Touré worked hard and had tough defenders guarding him, but thanks to his pace and strength, he was able to score two great goals. Touré looked sharp all afternoon and I hope he will soon win the professional contract he desperately wants and definitely deserves. Iddrisu Nafiu (born 12.06.1986), the strong centre forward, played a few minutes as a substitute but I was not able to see who he replaced. I feel sorry for the hard-fighting Bechem United FC. The club played with Maxwell Fiifi Eshun in goal. Eshun is usually backup goalkeeper for Ransford Kudjoe but showed that he is an agile goalkeeper despite conceding four goals. 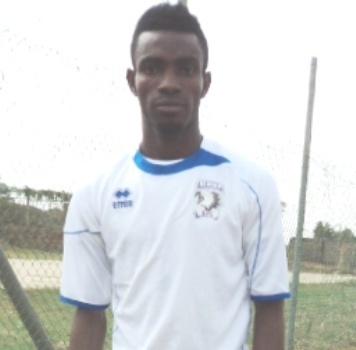 Their left-back of Bechem United FC was Rashid Abdul while Godfred Ofosu (born 21.01.1989) played at the right side of the defense. Abdul is one of my favourite left-backs in the GLO Premier League. Abdul is a tall, strong full-back with a cultured left-foot and a dangerous long-throw. From my point of view, Abdul is actually one of the best attacking players at Bechem United FC. Ofosu had a poor game by his high standards, struggling with the lively Okrah. Captain James Yaw Papa Yeboah and Maxwell Mensah (born 04.10.1985) played in the heart of the defence, having a hard time controlling Ahmed Touré. Mensah is usually a very confident central defender who has been a key performer this season. Theophilus Apoh (born 30.04.1985), formerly of Hearts of Oak SC, played at the central midfield together with the talented Evans Osei. Apoh is a strong, hard-tackling player while Osei is a tricky and creative player who I think can reach far. Abraham Annan (born 08.12.1988) had a very quiet game at the left side of the midfield while the usually brilliant right-winger Peter Essien was rather average. Essien has been linked to several Ghanian top clubs during the season. The picture is of Essien and is taken from Ghanasoccernet. Annan was replaced with the burly striker Eric Fordjour (07.08.1988) who made a good account of himself, impressing with his strength and power. Essien has perhaps been the most exciting player at Bechem United FC this season, alongside top striker Richard Addai (born 27.07.1986). Essien was replaced with striker Adamu Issah. Addai, top scorer at the club with 11 league goals, worked hard and gave room for his new striking partner, the experienced Reginald Asante. Asante, a much-travelled attacker, was a trialist at Polish club GKS Belchatow in 2007 and apparently had a stint at Vietnamese club Quan khu 4 in 2009. According to some sources, Asante was part of Liberty Professionals FC during the GLO Premier League 2010-2011, but I am not able to document any games played. Asante scored a wonderful hattrick, scoring once with a powerful shot, once with a strong header and one clinical penalty goal. I am not sure but I think central defender Bismark Yaw Osei made a substitute appearance as well.